Born in Veracruz Mexico, Eduardo Sanchez grew up surrounded by Mexican culture and food. In 2006, Eduardo Sanchez opens his First Restaurant to bring his inventive style of gourmet Mexican cooking to an initially Menasha, Wi. Audience. Solea, with its casual take on refined Mexican cuisine, captured the hearts (and stomachs) of food- and fun-loving Menasha people and Solea Mexican Grill became a household name. 2008 has been a banner year for Eduardo Sanchez and his Modern Mexican group. Solea open the doors of a Second location at Neenah, Wi. Eduardo Sanchez has been a pioneer bringing refined Mexican food to this part of the country. By redefining this historic cuisine he has become a leader in the upscale Latin Culinary Movement he is a revolutionary in his own culinary way, cooking with such innovation and refinement that Modern Mexican Cuisine. Solea Mexican Grill is now recognized as one of the great culinary experiences of the Midwest. 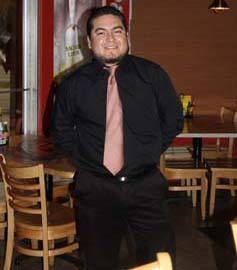 Eduardo founded Solea at 2006. Born in Fortin Veracruz Mexico, Eduardo has lived in Wisconsin since 1995. What is your favorite natural setting? The view of the Uxmal ruins at dawn. It's just beautiful! Cooking dinner with family, friends and drinking beer ha! You are starving and you have only 20 minutes to put something together. What is your go-to meal? It will be so simple: Good artisan bread such as Bolillo or Foccacia, Mayonnaise, good quality ham or salami, onions, tomatoes, oregano and a very good olive oil. I like to always have those things around. If you could have one, and only one, indulgent beverage - Wine, Beer, Tequila, or Coffee - which would it be? Beer, of course! I'm in love with my Bud Light! When did you know the restaurant world was for you? What is the moment you decided you needed to be in this environment? 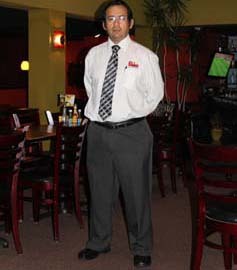 Way back, 1995, the first day I worked in the restaurant at Tumbleweed. You have landed yourself on a desert island. What book and piece of music/album would you bring with you? Aztec by Gary Jennings, Music by Luis Miguel, the BEST Hispanic performer! What is your fantasy profession, something you might not have the ability to do, but would thrill you? To play Soccer for Real Madrid! (Spain Soccer Team).. I want to be able to be the Pichichi, the Best Golly in the league!! What are your indulgence foods, the stuff you can't say no to? What is your most rewarding thing in the Hospitality Industry? 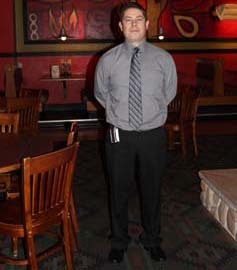 Winning the “Golden Fork Award” For “The Best Service at the Valley” in 2009. Outside of Mexico and your professional life, what is your most memorable meal? Eating at my Mom's House every Sunday “Priceless”!!! To be able to function on less sleep – if I could get by on 3 or 4 hours of sleep a day, I would be really happy. I think food was always subconsciously in my mind. The way I grew up all of our important events were around food. Instead of going to Walt Disney World, we went to a nice restaurant. It was central and important, and I couldn't think of anything else I would rather do with my life. Going for a bike ride with my kids, I enjoy this during the good spring, and summer season, during the winter time, change my relaxing time to indoor soccer. I will just get sandwich, granola bar and a fruit. I will say depending of what time it is, during the day coffee, at night, after work a beer. I never knew, just happen and here I am! I always wanted to be a professional soccer player and play in Europe. What are your indulgence foods, the stuff you can’t say no to? In my career in the Hospitaly Industry I meet a lot a good people! Will be the Japanese food! I like to observe people; they can be so much fun. A nice day, feel energized to do my best every day. Absolutely a very cold corona. When I felt the pleasure to serving people and saw a people very happy. Definitely would be a Pilot because I’ve always dreamed of faying. Ill say I like all the food of all kinds, but one can never miss a DESSERT!!!!!. My own satisfaction to do what I really like to do ALWAYS! I START In THE Kitchen AND I DISCOVERED THIS NEW SIDE OF ME. I ENJOY COOKING THEN I MOVE TO THE FRONT SIDE AND LOVING IT! WI really enjoy it CHRISTMAS DINNER BECAUSE I CAN HAVE ALL MY FAMILY TOGETHER no matter where we are!